Yesterday, I and many developers received an email from Google Developers that had the subject line "[Action Required] Google+ APIs and OAuth requests are being shutdown on March 7, 2019." 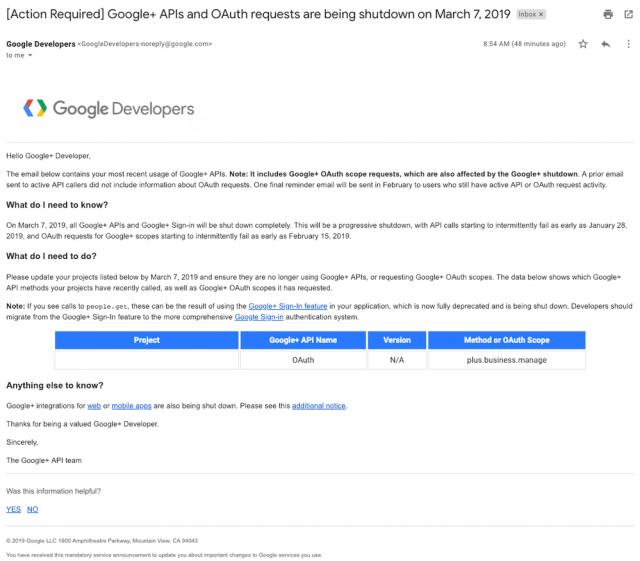 The issue is not specific with Google+ but some of those APIs in there are specific to Google My Business and they have no replacement or migration path. Since the Google+ API is going to be deprecated, how do we replace the plus.business.manage scope? Besides plus.business.manage.scope, I also got the notice for plus.people.getOpenIdConnect which I use for logging in to my app using Google. Google has not responded to any of these concerns. It is not clear if they are aware of the issue or working on a solution.